The best banquet room St Cloud has to offer for your anniversary party, groom’s dinner, retirement party, class reunion, family reunion, birthday party, and Holiday celebration. Choose our cozy Tradition Room that seats up to 55 people with its inviting fireplace and French door entrances making it perfect for you special event. Looking for a little more room? Our Patio Room has a tremendous view of the golf course. It seats up to 70 people and is a great choice for retirement parties, anniversary dinners, class reunions, and small weddings. Reserve both the patio and adjoining lounge to seat up to 100 people. To reserve either the Tradition Room or the Patio Room there is no room rental for groups over 40 people with the purchase of food and beverages. For groups of 30-39 people there is a $50 room rental, or a $75 room rental for 20-29 people to have the room private. If you are just looking for a small semi private room this is available at no charge. If you need more space no need to worry you can host your event in our Banquet room with seating up to 275 people, it makes for the ideal venue for a fundraiser, appreciation dinner, anniversary, or meeting. The lower banquet room has an abundance of windows for a beautiful view of the golf course and a large outside patio area for your use. Do you want a meeting space in St Cloud that makes people excited to attend a meeting or training session? Our bright, window filled rooms are perfect for a meeting or training session. We can accommodate meeting groups from 10-100 classroom style with our 3 different event rooms, seating aver 100 available with different set up. We can customize a meal plan to fit your groups’ specific needs. 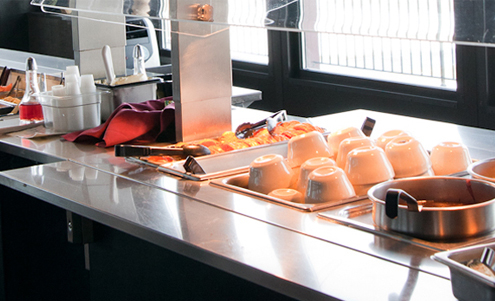 Ask us about our Fast Lane Lunch Buffet for your meetings noon lunch. Lunch buffet includes 3 hot entrees, potato, vegetable, salad, and popovers for only $7.95 per person plus tax and gratuity. Breakfast, snack, beverages, and other lunch options available. complimentary AV equipment includes a in house PA (Banquet Hall MN Only), projector (Banquet Hall MN Only), portable PA, screens, flip chart, and easels.